The Sidebar: Trouble in paradise: Ohio fireman gets lifesaving award for near-drowning rescue of a Korean tourist in Hawaii. But he performed an unapproved, discredited treatment on the victim - abdominal thrusts - and her condition is uncertain. Trouble in paradise: Ohio fireman gets lifesaving award for near-drowning rescue of a Korean tourist in Hawaii. But he performed an unapproved, discredited treatment on the victim - abdominal thrusts - and her condition is uncertain. A Norwood firefighter is called a hero after trying to save someone's life on his honeymoon. He and his wife were in Hawaii when they came across a woman who was face down in the water. ...(Philip) Reed and his wife were honeymooning on the island of Oahu near the Hanauma Bay, just east of Honolulu. They swam out toward the reef to go snorkeling. "I said hey its starting to get a little rough I think we should head back and about that time we heard some woman screaming. As we get closer we saw her pointing to the water. There was a woman face down in the water." Reed and his wife pulled her onto the reef. "I kept giving her abdominal thrusts to get water out of her. We gave her more rescue breaths." As a firefighter and paramedic, Phil knows how to deal with an emergency. but this was different. "I have had no water rescue training." 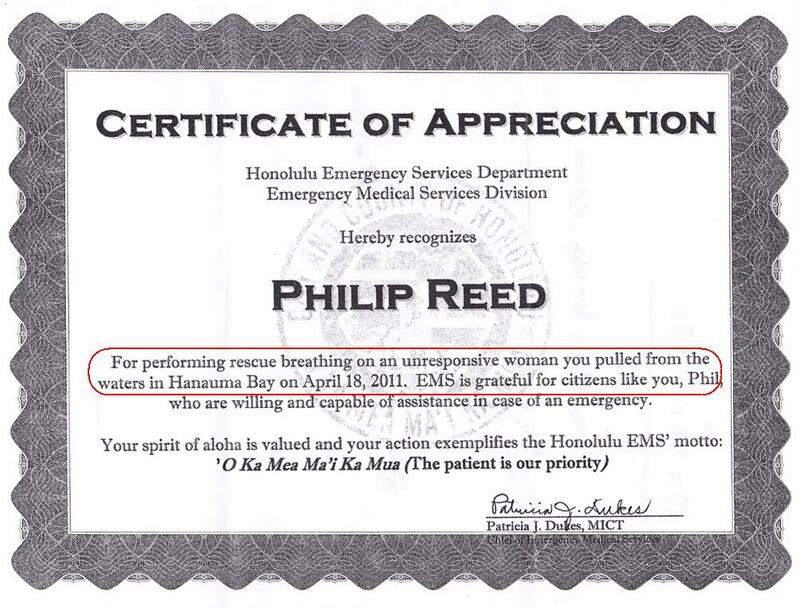 (Today) he got a certificate and a letter from (Honolulu's) chief of EMS...I'm just glad we were able to do something and hopefully we gave her the best chance she had." As for what happened to the woman...Phil was told she was on life support when they left the island. But he doesn't even (know) if she survived. The Heimlich maneuver (abdominal thrusts) became famous as a way for people to dislodge a foreign object from a choking person’s airway. But it’s been utterly discredited as a way of rescuing a person who is drowning, and can actually do serious harm to someone who has just been pulled from the water, numerous experts say. ...In Tampa, which has one of the highest drowning rates in the country, Dr. James Orlowski (at University Community Hospital) said he has documented nearly 40 cases where rescuers performing the Heimlich maneuver have caused complications for the victim. Why did the Norwood fireman perform an unapproved, discredited treatment on the drowning woman? Why was he given an award for doing so? Why did the fireman accept an EMS award and participate in a news report without even knowing if the woman was still alive? And why did WKRC report the story without knowing whether or not the woman survived? According to two April 18 media reports, she didn't. How do I know this is the same case reported by WKRC? First, it's not in the text version of the Cincinnati news report, but in the video, Dan Spehler says the event happened "a couple of months ago." 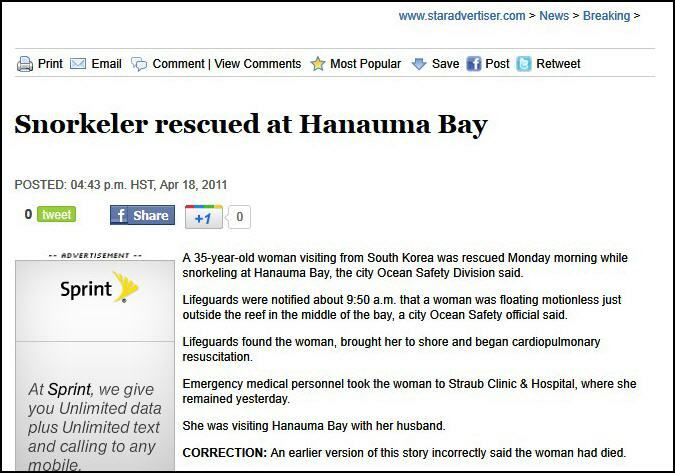 Based on that information, in minutes I located the two Honolulu news stories via Google. Apparently that idea never occurred to anyone at the Norwood Fire Department or WKRC, who were busy celebrating the award. Note the Honolulu EMS motto. Next, here's an e-mail I received in response to an inquiry I sent to City and County of Honolulu. Per my red highlighting, this is when the story took an unexpected turn. Peter: Here are the responses to your questions. 2) Would you please provide me with a copy of the letter and certificate Chief Dukes sent to Mr. Reed? E-mail or fax would be best. The City and County of Honolulu recognized Mr. Reed for responding to an emergency at Hanauma Bay and providing rescue breathing prior to the arrival of lifeguards. It was never reported to us that Mr. Reed had performed abdominal thrusts at the scene. 3) Would you please provide me with the date of the near-drowning, the victim's name, and the victim's present condition? On April 18, 2011, a woman was transported from Hanauma Bay to Straub Hospital in critical condition. The media reports that stated she died at the hospital soon after arrival were incorrect. We do not have information on her current condition. I asked Ms. McCoy who provided her with this information. She answered that it came from the Emergency Services Department. On April 18 at Hanauma Bay, the Norwood fireman/paramedic and his wife happened upon a woman who was drowning. They pulled her onto a reef and, along with rescue breaths, he repeatedly applied abdominal thrusts. The woman, a 35 year-old tourist from Korea, was transported to Straub Hospital in critical condition. Later that day, two area news outlets incorrectly reported that she died. About two months later, Honolulu EMS chief Patty Dukes sent the award to the fireman, someone told WKRC about it and Dan Spehler reported the story, characterizing the fireman as a hero. Though they all knew she had been in critical condition at the time of the accident, apparently none of these parties made any effort to verify the patient's current condition. It's unclear what Dukes knew and when. Was she aware of the patient's condition when she presented the award? Dave Platte, News Director at Hawaii News Now, says the information his station reported originated from Honolulu EMS. O Ka Mea Ma'i Ka Mua. The patient is our priority. Sounds nice anyway. I wanted to know what happened to the Korean woman, so I started making calls. Eventually I located a source who was close to the situation and who was willing to talk. The source informed me that the woman had remained in a coma for an entire month at Straub Hospital. Then, at considerable personal expense - $100,000 according to my source - the patient's husband arranged to have his wife airlifted to Seoul to be cared for at Yonsei University Health System. Yonsei University Health System (YUHS) was founded in 1885 as the first modern medical institution in Korea by the American medical missionary, Dr. Horace N. Allen...As the hospital expanded over the years to include various colleges and research centers, the Yonsei University Health System was born. YUHS has been the leader of medicine and is respected as the protector of Korean health. Furthermore, the roots of Christianity, modern medical education and medical care in Korea can all be linked to YUHS. On Monday, I spoke with Jiman Kim, Vice Consul at the Consulate General of the Republic of Korea in Honolulu. I told him that I was writing about the case and he informed me that he has remained in contact with the patient's husband since the accident. He explained that due to privacy issues, he could not share or confirm any of the details I obtained from my source. However, he said he didn't have a problem forwarding information to the patient's husband. Finally, last week I submitted corrections requests to the two Hawaiian news outlets that misreported the story. Honolulu News Now News Director Mark Platte chose the Orwellian route and simply disappeared the mistake. 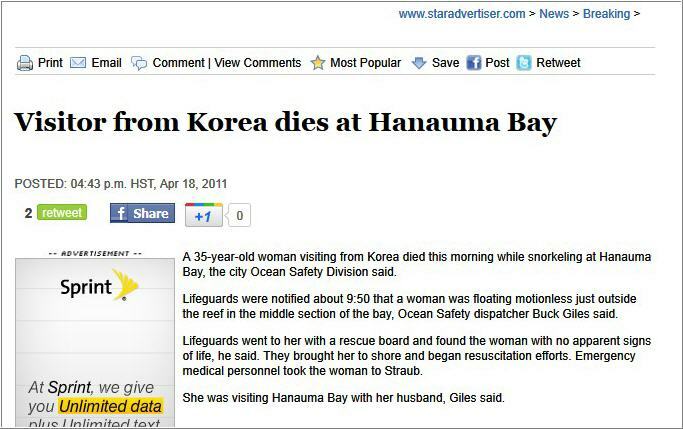 When we realized the Korean visitor had not died, as EMS officials told us, we removed our story from our Web site. Thanks for letting us know the sequence of events for a future story. We will call you if we need more information. Based on your e-mail, my understanding is that Hawaii News Now policy is that when your station is informed that a story posted on your website includes false or incorrect information, the original story is deleted. If my understanding is incorrect, please explain before Tuesday, August 2. Also, if you station has a corrections policy, please provide me with a copy before that date. I haven't received a reply, but maybe that disappeared, too.